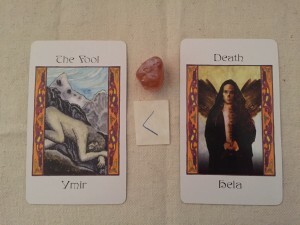 Today’s draw: Ymir/The Fool; Kenaz; Hela/Death. The presence of two Major Arcana cards says that it’s Transition Time. 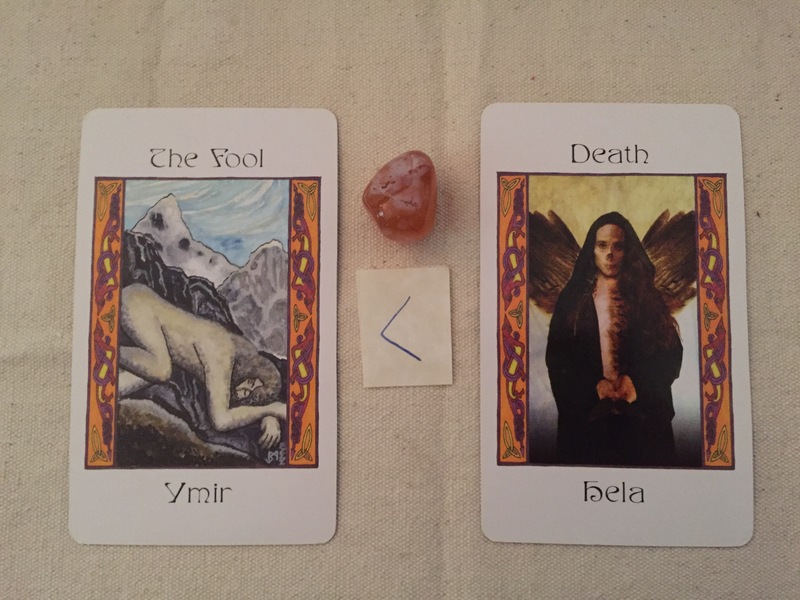 These two cards in particular–Ymir, The Fool, carries the energy of beginnings, and Hela, Death, carries the energy of endings–leave no wiggle room in this reading. Kenaz is upright today, so unlike last week, we have light to see where we are, even if the path ahead isn’t brightly lit. We can see far enough ahead to take one step, and then another, at the pace the Universe sets for us. Always remember that we are on the Universe’s timetable, not the other way around. If you haven’t let go of the things that are holding you back, Hela is here to take them. You do not need them, there is no reason to keep them. You can relinquish them consciously, with thanks and blessings, or you can be left standing empty-handed, wondering what happened. Visualize giving them all to Hela, thank Her for taking them from you, and release them with a blessing for having learned those lessons and being ready to move on. You may not know where you are going, but know that you will get there.